Welcome back to Academic Writing – the course with the tips and knowledge for top-class writing on your distance learning course. This time we're looking at how to be critical in your writing. 'Criticism' in an academic context means 'careful analysis of what other people have said or written and stating whether or not we agree with them – and why'. Are you ready to get critical? Writing critically: what's your attitude? In British academic culture, students are usually expected to examine other researchers’ ideas carefully, and then comment on them in their assignments, usually stating whether they are acceptable or not. Scroll down and try our activities to improve your critical writing! Imagine you're writing an essay. You're including several sources, and because you're writing critically, you need to comment on them. Which of these six verbs can you use to indicate that you agree with a source? Smith (2013) argues that the moon is made of cheese. Does the writer agree or not? Foot and Gregory (2002) assert that consumers 'naturally’' make choices according to Maslow's hierarchy. Does the writer agree with Foot and Gregory? Katsoulis (2009) shows that introverted employees tend to be more productive when working for introverted managers. Does the writer agree or disagree with Katsoulis? Jones (2014) maintains that Spanish will be the most common language in the USA by 2035. Does the writer agree with Jones or not? Smith (2013) demonstrates that the moon is made of cheese. Does the writer agree with Smith? Abbaon et al (2016) claim that the synthesis of these polymers is possible only under laboratory conditions. Does the writer agree with Abbaon et al or not? That's right! 'Argue' is a distancing verb – use it to avoid showing whether you agree or disagree with a source. Sorry, that's wrong. Is the writer agreeing when they use the word 'argue'? That's right! 'Assert' is a 'distancing verb'. Use it when you don't want to say whether or not you agree with Foot and Gregory. Sorry, that's wrong. 'Assert' is a 'distancing verb'. Use it when you don't want to say whether or not you agree with Foot and Gregory. That's right! By using the 'endorsing verb', 'show', you're saying that you accept and agree with Katsoulis' findings. Sorry, that's wrong. By using the 'endorsing verb', 'show', you're saying that you accept and agree with Katsoulis' findings. That's right! 'Maintain' is another 'distancing verb'. Use it when you don't want to say whether or not you agree with Jones. Sorry, that's wrong. 'Maintain' is another 'distancing verb'. Use it when you don't want to say whether or not you agree with Jones. That's right! 'Claim' is a 'distancing verb'. Use it when you don't want to say whether or not you agree with the source. Sorry, that's wrong. 'Claim' is a 'distancing verb'. Use it when you don't want to say whether or not you agree with the source. So, we can use verbs like 'demonstrate' and 'show' to indicate that we agree with a source. 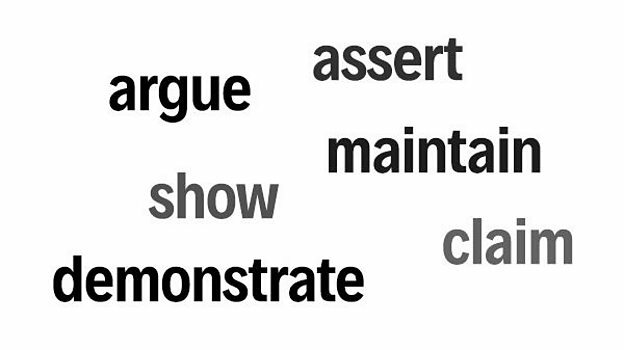 These are sometimes called 'endorsing verbs'. Alternatively, we can use a 'distancing verb' like 'argue', 'claim', 'assert' and 'maintain' to indicate that we're reporting what our source says, without saying whether or not we agree with it. So now you know about reporting verbs, it's time to take a look at some other phrases you can use to show whether you agree with an academic source or not. Go to the next activity to find out how!